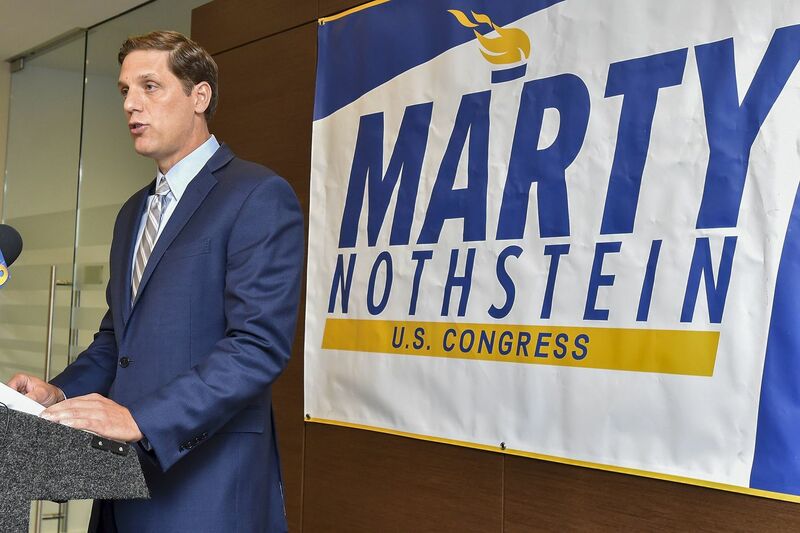 Republican Marty Nothstein, who is running for Congress in the Lehigh Valley, said he had been cleared of misconduct allegations. A Pennsylvania congressional candidate said Friday that he had been cleared of allegations of sexual misconduct. Republican Marty Nothstein, who is running for an open seat in the Lehigh Valley against Democrat Susan Wild, said the organization that investigated the allegations found "no evidence of wrongdoing on my part." The race is considered one of the most competitive in the region and could help determine which party controls Congress after the midterm elections. Nothstein called the unspecified allegations — lodged days after he launched his candidacy in October 2017, and disclosed last week by the Allentown Morning Call — a "politically timed smear." "This entire episode is a clear example of why good people don't seek political office," Nothstein said at a news conference. Nothstein, a Lehigh County commissioner and Olympic gold medalist in cycling, said the claims originated from an anonymous tipster regarding an alleged incident in 2000. He was placed on unpaid leave from his job as executive director of the Lehigh Valley velodrome in February, soon after the organization learned of the accusations. The two alleged victims signed affidavits refuting the allegations, according to Nothstein and his lawyer. Nothstein has declined to make the affidavits public, saying the women wanted to maintain their privacy. The U.S. Center for SafeSport, an arm of the U.S. Olympic Committee, wrote Nothstein this week that it had completed its investigation, according to an email obtained by WFMZ in Allentown. SafeSport said it could reopen the inquiry if "additionally relevant information" came to light. Nothstein's lawyer, William Chadwick, said that Lehigh County law enforcement had already examined the accusations and found them to be without merit.